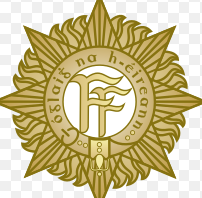 In 1983 when soldiers serving Ireland, first rubbed shoulders with the Royal British Legion to commemorate the Anglo-German Armistice of 1918, complaints appeared in the letters page of the Irish Times from distinguished veterans including General M J Costello who had fought in the ‘Tan War, the Civil War (on the “Treaty” side) established Military College at the Curragh, commanded the Southern Command during the 1939-1945 Emergency*, and served the nation with distinction as head of Comhlucht Siucre Eireann for a further twenty years. The Royal British Legion’s annual parades in Dublin had been provocative, according to the Gardai during the 1920s. At least once they had marched in step with the Dublin Branch of the British Union of Fascists. Anyhow, though I would not class myself with M.J.Costello, I believe that he and my Aunt Eileen shared a godfather in Thomas MacDonagh, I’m a veteran of the Defence Forces. Though I hope I wasn’t a Sunshine Soldier nor a Sunshine Patriot, in Tom Paine’s immortal phrase, I used parade on a Sunday and spend two weeks in a training camp every year. .I was never asked to form a Guard of Honour for a piece of base metal, but form one-hundredth part of such a guard President de Valera when the Asgard returned to Howth in 1961, and in 1963 opposite the GPO n Easter Sunday. I still regard those episodes as golden memories. The public attendance was inclusive of all , or most citizens who valued national independence and were not party-political. Another time I was a member of a small guard of honour for the belated unveiling of a tombstone over the grave of a Volunteer who had been buried since Easter Week 1916. I don’t remember his name, but he was one of three Insurgents killed at the Battle of Ashbourne, when the Insurgents under the leadership of Thomas Ashe and Richard Mulcahy attacked a more numerous force of the Royal Irish Constabulary, killing many, and taking them prisoner. Nobody had thought to erect a (very modest) tombstone in the nearly fifty years since the patriot’s death. And even when it was unveiled only one TD and a small number of citizens were there to witness our salute. I’ve no complaint about that. But I resent the fact that regular soldiers of our Defence forces, for whom attendance at parades is not optional (unlike that of Sunday Patriots) should be forced to pay respects to a base metal idol.